Hi guys! This is my first blog in a long time... 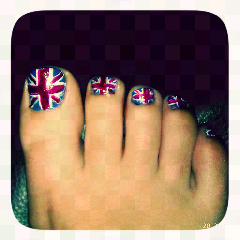 I have been so busy lately but I made time to paint some fun union jacks on my toe nails for the queens diamond jubilee celebration. I hope you like :) (and I'm sorry for the low quality photo, I'm using my mobile for this blog so I'm not too sure how the layout etc will look too). Hopefully I'll get my act together and my next blog won't be as long a wait. this is nice, good work doing it on even your smallest toe!